Recently, we created the show imagery for 'The Barber of Seville', a brand new opera from the WNO. 'The Barber of Seville' is the first opera in a trilogy featuring Figaro, and the title image (below) was conceptualised by Alex working closely with WNO. The photo was shot before Christmas in our studio by Alex with assistance from Gareth Aled, and features the signature WNO paint strokes. Overall for this project, we provided planning / production / art direction / photography / post production / model management / styling and costumes. About a month after finishing our work for The Barber of Seville, we began noticing the image... everywhere. It's normal to see our photos used in advertising campaigns here there and everywhere, but this one found its way to every nook and cranny in Cardiff. It popped up around town, and was seen by several members of the Burning Red team at various locations - sometimes before they'd had a chance to snap a photo! Enter 'Spotted', the game of finding the elusive Figaro, wherever he's hiding. These are a few instances of finding the image around town - if you spot one yourself, snap it and send it in! Reward for best photo: some Burning Red goodies! The Barber of Seville has a fantastic slapstick energy, and the pace is fast and never lets up from the start. If you're not yet an opera lover, make this your first outing - it's upbeat, full of wit, and totally brilliant. 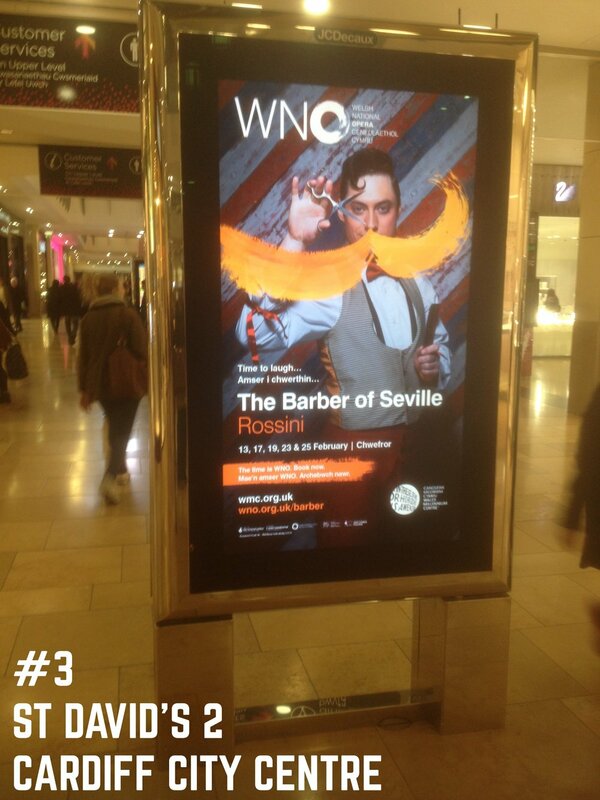 To book tickets for The Barber of Seville (playing hide & seek across the UK until 8th April), visit the WNO website. Have you seen The Barber of Seville? We'd love to know, so send us your photo! REWARD OFFERED: the best photo wins some Burning Red goodies!